Have you ever noticed how steaming hot your garage gets in the summer and how freezing cold the room above it gets in the winter? This happens if your garage doesn’t have any insulation. What you probably didn’t realize is that had your garage been insulated your heating bills probably wouldn’t be that high. To insulate or not to insulate? Here are some points to consider if you’re thinking of doing so. Insulation helps to lower your electricity and heating bills. If your home has a room above or next to the garage, that room can – just like the garage – get extremely hot during the summer and ultra cold during winter. Insulating the garage, or at the very least the garage door, will help to make that area and the room above or adjacent to it more bearable during these times of extreme weather. This translates to lower electricity and heating bills whatever the season. You can DIY it with a kit. Yes, you can insulate your garage door yourself. There are DIY garage door insulation kits that you can buy from Home Depot or the hardware store. Insulation materials vary from polystyrene, fiberglass (not to be used on wooden doors), to polyethylene. Among the better known brands are Owen Corning, Falcon Foam, Anco, and Astro-Foil. A kit (for one door) will cost you anywhere from about $75 to $90. If you’ve got a 2-door garage, buy two kits. You can also do a non-kit DIY. Ready made kit too expensive? Other people have reported success with styrofoam (polystyrene), reflective foil insulation, or fiberglass batting. This may be a cheaper option – you can buy the materials yourself and attach the insulation to your garage door with double sided mounting tape. 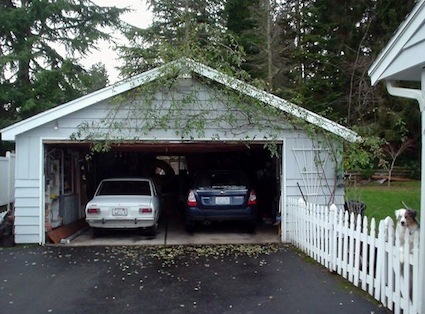 Rebalance the garage door and adjust tension springs afterwards. Remember to have your door rebalanced after you install the insulation. When you put in an insulation panel on your garage door, you’re adding to the weight that the springs the door opener has to carry. The door will need to be rebalanced and the spring tensions adjusted in order to prevent breakdown. Seal the bottom of the garage door. Don’t forget to seal the bottom of your garage door as well, in order to prevent wind from going through the door bottom. For this, use a garage door threshold kit. This will keep out the wind, dust, water, leaves, and pollen from your garage. Garage door threshold kits can cost anywhere from $25 to $100 depending on the size. You can replace your door with a new pre-insulated garage door. This is the most expensive option, but if you’re looking for a long-term solution, this would be the best. With an insulated Garage Door Huntington Beach you can expect to spend many productive hours in your garage for many years, come summer or winter, and see your HVAC bills go down. Adv. — Are you planning a trip this season? If so, visit SayFunTravel.com for the best deals on hotels, car rentals, air fare, cruises and other travel arrangements. Tom Drake is a content contributor for Precision Garage Doors of California. Precision provides installation and garage door repair services throughout Orange County and offers 24-hour emergency service.